What does a circular economy business look like? Who benefits from a circular economy? How do you grow your business towards the circular economy? What level of innovation do you need to achieve a successful circular economy strategy? What technology opportunities are there to help turn environmental waste into a new source of revenue? What does the internal sell look like to shift perceptions toward the circular economy? Network with the most senior leaders of Responsible Business across North America at Ethical Corporation’s 5th Responsible Business Summit NY. 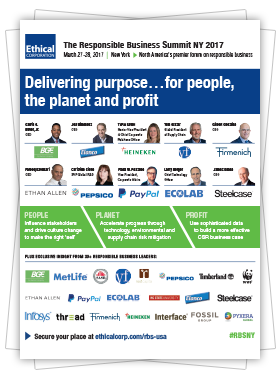 Dell, Aquafil and Horsehead Corporation join 200+ CSR execs at #RBSNY. Simply fill in your details below and receive the complete agenda and speaker line-up.